ROG Sheath has an intricately-woven surface that's perfectly to ensure a smooth glide for your gaming mouse. Whatever your preferred gaming settings are - you're guaranteed pixel-precise control. A Sheath is a protective scabbard for swords and blades. 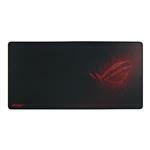 In our gaming world, ROG Sheath serves as the home base for all your gaming peripherals as you command them into battle. Your opponents may be crushed or ripped to shreds, but not ROG Sheath! Get ready to experience gaming stardom with ROG Sheath - now!